April | 2016 | Curiousity? My other goal for 2015 was to try some more stranded colourwork that wasn’t double-knitting. I had intended to do more simple stuff, but I fell in love with this pattern and you know how it goes from there. 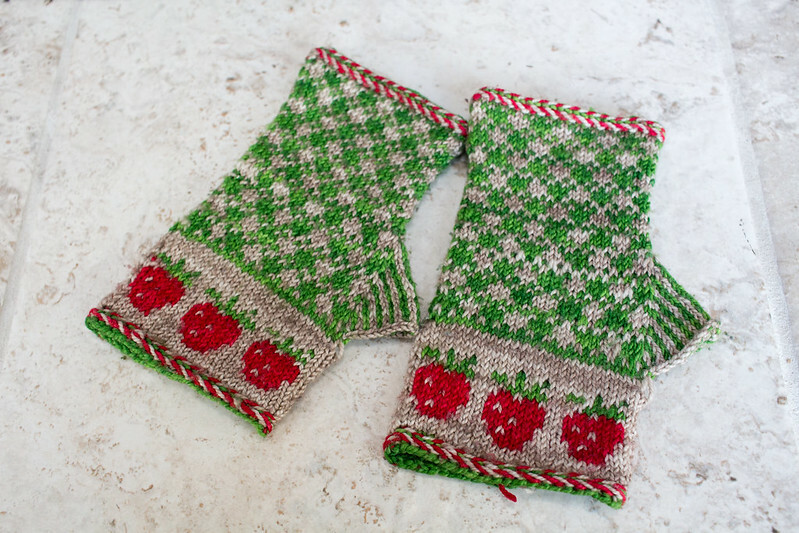 The pattern is Strawberry Fields by Jami Brynildson. 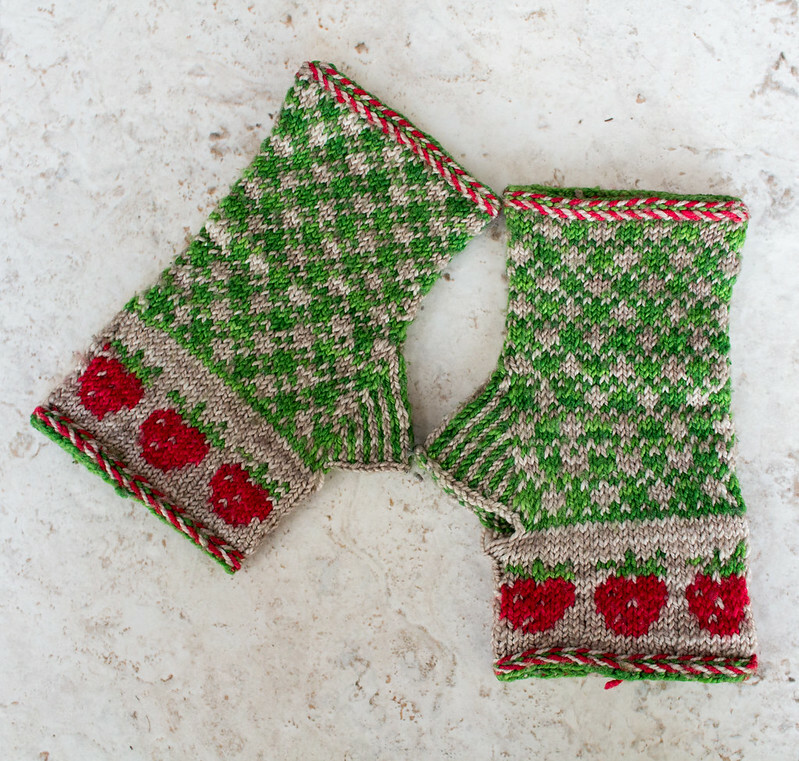 It was one of the shop patterns offered by Knitting Bee during the 2015 yarn crawl (shops offer one or two patterns free with purchase during the crawl and they’re available for sale after the event). I got the kit at Knitting Bee during the crawl since it was one of the patterns I knew I wanted to make. The yarn is Black Trillium pebble sock yarn, which is amazing and I would totally work with again. The kit was more than enough to do the pattern, so I’ve got some nice little balls left over for a dash of colour in some future project. These gloves have actually been done since sometime in 2015, and I wear them around town all the time because they’re among the smallest warm gloves I have. 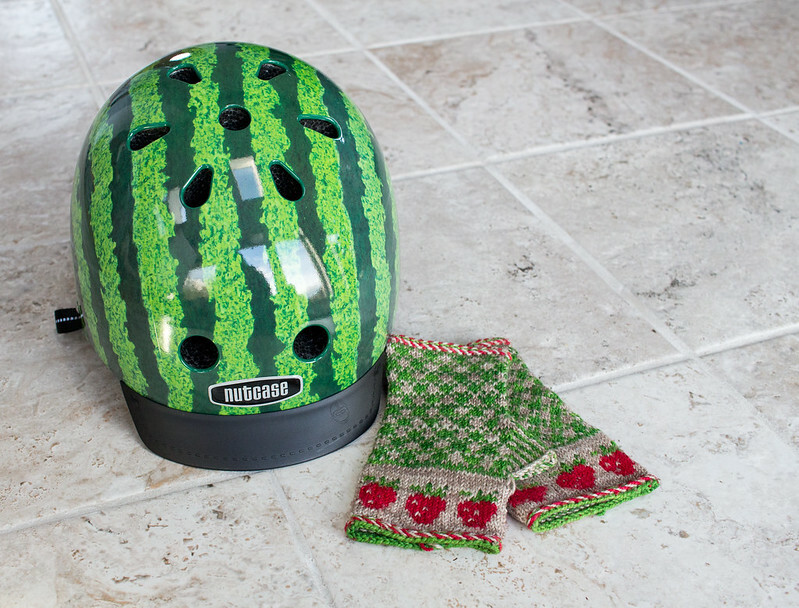 I particularly like that the colours go with my watermelon bike helmet, which is from the delightful Nutcase Helmets. I also like to think that their name is a statement on my mental state, which I assume is why they put it on the front of the helmet. I saw someone with one of these out on the road by the grocery store and knew I wanted one when my helmet was due for upgrading. The gloves a little more beat up than they were fresh off the needles (you can see a yarn tail that’s come unwoven in the photos) but I hadn’t shared them when they were finished so now’s as good a time as any! I did modify the thumb a little bit, as the original one felt too tight for my comfort. I don’t like having my motion restricted, and being able to spread my hands wide is kind of important when braking on the bicycle! Working with wool for colourwork is much easier than acrylic or cotton. My other tests had been with cheaper yarn, and it turns out I wasn’t doing myself any favours. The wool is much more forgiving, blocks better, sticks to itself better, and is just all ’round easier. Don’t pull anything tight. Those floats behind need to be longer than you think, and I can still see places where I pulled a bit too tight to fully block out. I need more practice doing colourwork while using magic loop (I did two gloves at a time on a single long circular needle). Blocking is magic. These looked ok on the needles, but they look beautiful after blocking. I want to do more colourwork! As to the last, I’ve already started on more experimentation with colours thanks to my yarn sampler subscriptions, but expect more projects in 2016!